5i Strategic Affairs helps individuals, organizations and society prepare for a successful future in a world of uncertainty using a customized mix of consulting services, workshops, conferences and one-on-one coaching. Our clients hire us when they are ready to address key issues that are hurting their performance and they wish to build a team or organization that is better prepared for success whatever happens in the future. 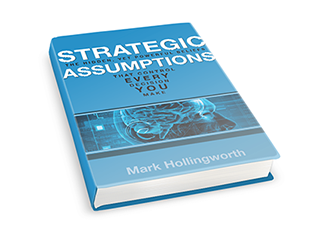 Why are Strategic Assumptions important? What assumptions are you making about your life, your organization or your career that are fueling your decision-making? Are they well-founded, or totally off-base? How will you know? How can you be assured that you are making the best decisions in an uncertain world? This book offers practical strategies for making important decisions with greater clarity and confidence, regardless of the accuracy of your underlying assumptions.